Duvall is a small city in northwestern Washington. The population is just over 7,000 and growing rapidly. In this area of northeastern King County, Duvall is largely rural and does not have many close neighbors, but is still conveniently located just 25 miles outside of Seattle. Nearby cities include Cottage Lake, Monroe, and Woodinville. 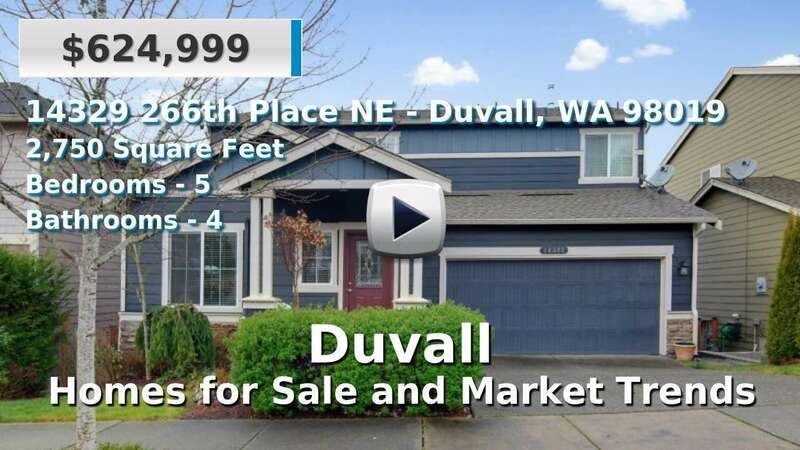 Homes for sale in Duvall are likely to offer larger lots and be more recently built than many of its more urban neighbors. 4 Beds | 2.5 Baths | 3536 sq. Ft.
4 Beds | 2.5 Baths | 2829 sq. Ft.
3 Beds | 2.5 Baths | 2590 sq. Ft.
4 Beds | 2.5 Baths | 1730 sq. Ft.
5 Beds | 2.5 Baths | 3240 sq. Ft.
4 Beds | 2.75 Baths | 2174 sq. Ft.
5 Beds | 3.25 Baths | 2943 sq. Ft.
5 Beds | 3.5 Baths | 2910 sq. Ft.